Wow, our first newsletter. This is exciting. Our photos tell it all. No matter the season, the amazing setting of Whistler will leave you full of memories to last a lifetime. While perusing our many pages you will notice a great many photos. The scenes we picture are those of the actual areas. For instance, this photo was taken of a group of visitors at Lillooet. 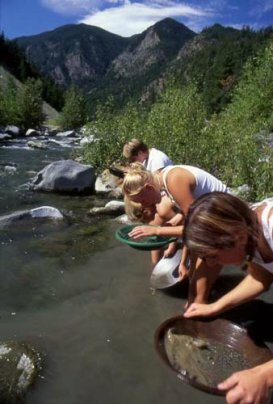 They are panning for gold just as the old timers did so many years ago during the Klondike gold rush. Nearly every page of our site features a favorite photo of the trail or lake or sport that was taken at that venue. We are continually adding to and tweaking our website to bring you the best content possible. Recently we began a series of pages relating to the Whistler Animals you may meet. They play a big part in the great whistler outdoors experience. On these pages we tell the habits of the different animals, how to protect yourselves from the larger ones and how to live harmoniously with these wonderful creatures. Two you don't want to mess with are the Grizzly Bear and the Black Bear. .
Touring Whistler is a new way to look at what you can accomplish in the run of a normal day in the Whistler Corridor. Many years ago people made Yule Logs. They would use them to add color to the fire in the fireplace on cold winter nights. Why not make some for your own and use them on your campfire. We recently paid a visit to Whistler to check on the construction for the highway as well as Olympics construction taking place on the various venues. Wow, it's amazing to see all of the activities taking place.